I use Argyll CMI II software and a JAVA interface built by my son to convert the .TXT file to .ICC profile. 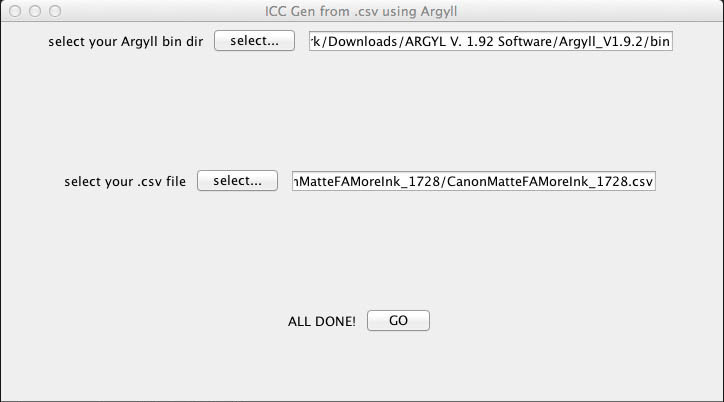 Install ICC GEN or use Argyll any other way you prefer, or any other software that will convert the .csv, or .txt file to an ICC profile. I1Profile, RGB DROP, and many other programs will do the same thing. 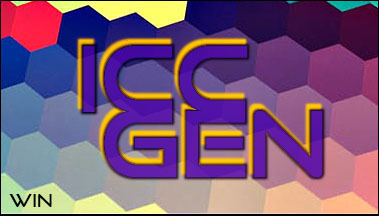 The ICC GEN program is made in Java and only works for both Mac and Windows systems. READ directions for installing and using. There is no technical suppoprt for ICC GEN. ICC GEN simply harnesses Argyll software and runs the commands. 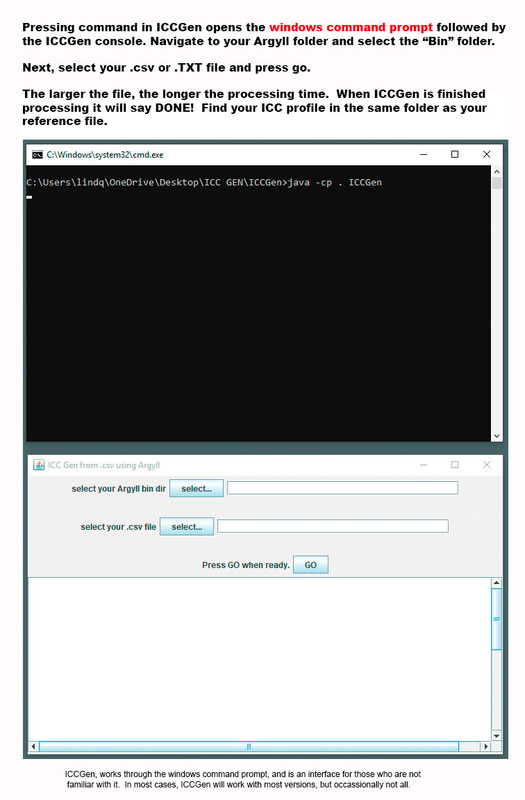 All you have to do is find the Bin folder where you have downloaded Argyll, and input that into the top selection, then specify anywhere you would like ICC GEN to put the finished ICC Profile. Press GO then wait, and after a while it says it's done and the ICC profile is with the .csv file. 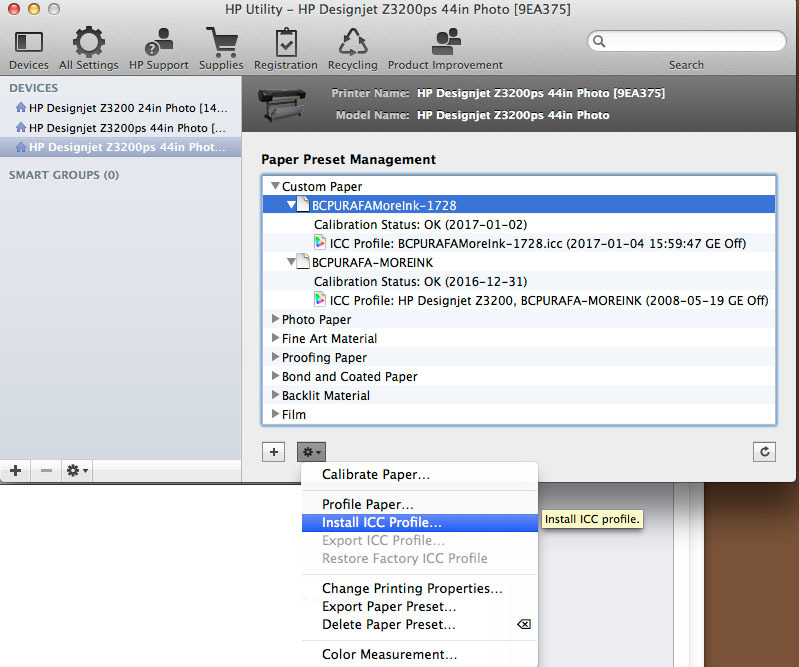 CREATE a FOLDER on your DESKTOP CALLED ICC GEN.
Next, Find the .ICC file (which is in the same file as your .csv or .txt file) and install it in the paper preset management under the exact profile that was created as a preset for the paper calibration. (It installs on top of the old profile and becomes the new profile. Ben Lindquist for creating ICC GEN for me to be able to use Argyll software without having to go into terminal. and to son Ben for figuring out what I did wrong. The profile is set up to generate an RGB profile for use with relative colormetric rendering intent. Future iterations may include others, such as perceptual, etc. This tutorial is for my own notes so that I can come back and remember how to do it, if I forget a part of it. If you use the tutorial, do so at your own risk. I make no guarantees. This is just how I do it on my Mac system.